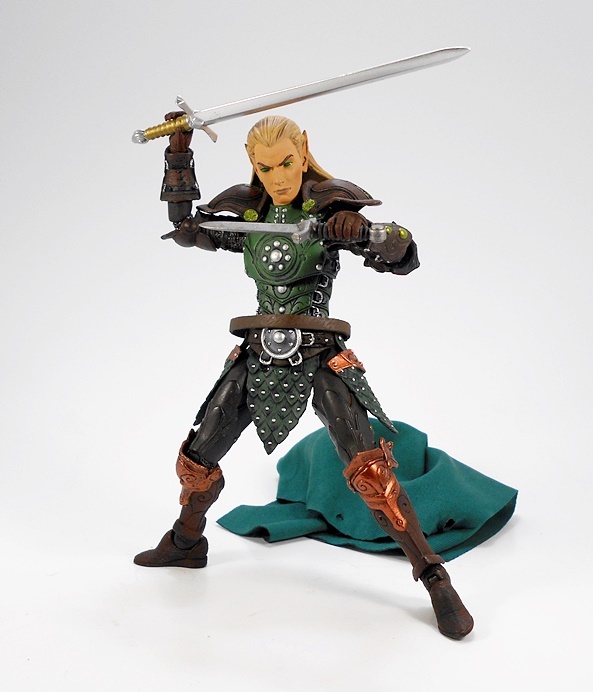 This week, I’m turning my attention back to the Elves, one of the major additions introduced to the Mythic Legions line in Advent of Decay. 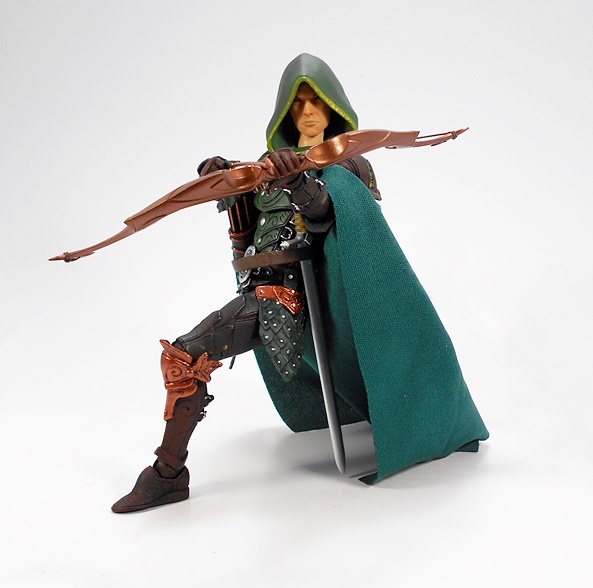 The Elf Ranger may not have a proper name or a bio, but he’s not one of the budget Legion Builders either. 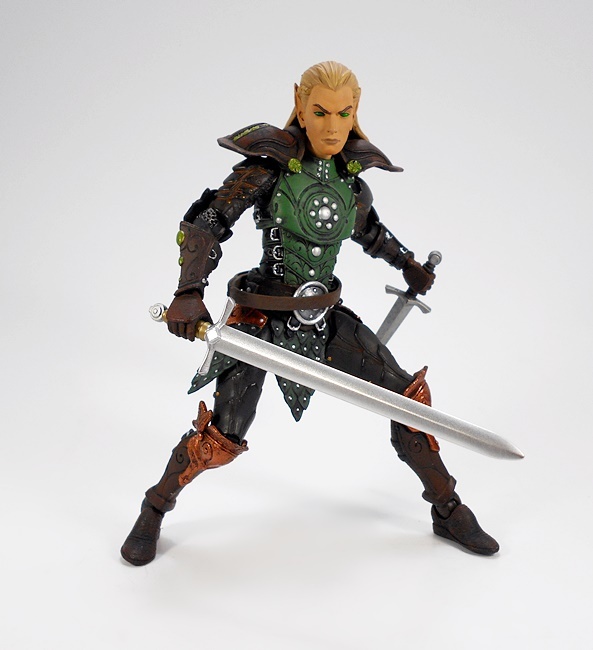 Nope, this guy is a regular release with all the paint apps and extra bits and bobs to prove it! He’s also one of the figures in this series that I was extra excited to get my hands on. What do you think? 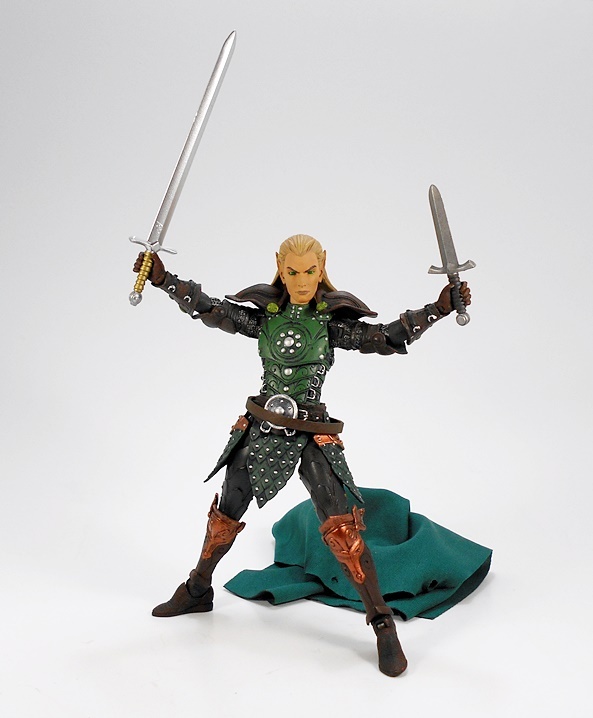 A little Legolas influence going on here? Maybe, and if so it sure ain’t a bad thing. 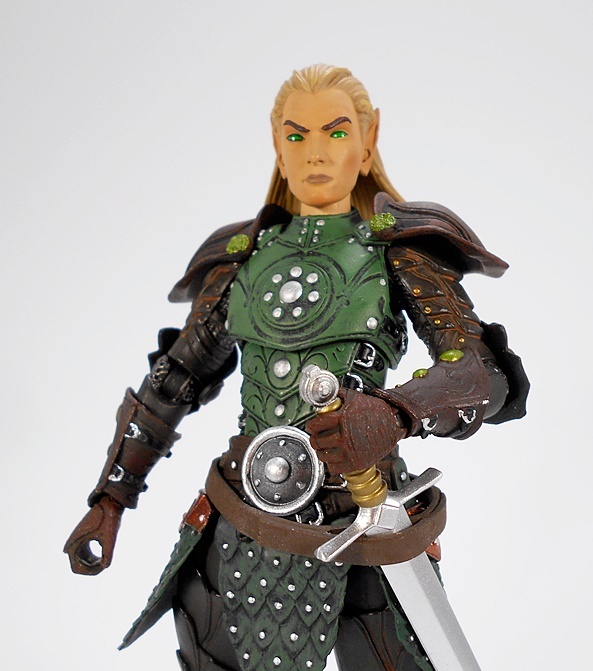 This body reuses the torso from the Elf Legion Builder I reviewed several weeks back, as well as the belt, and scaled hip and groin armor. 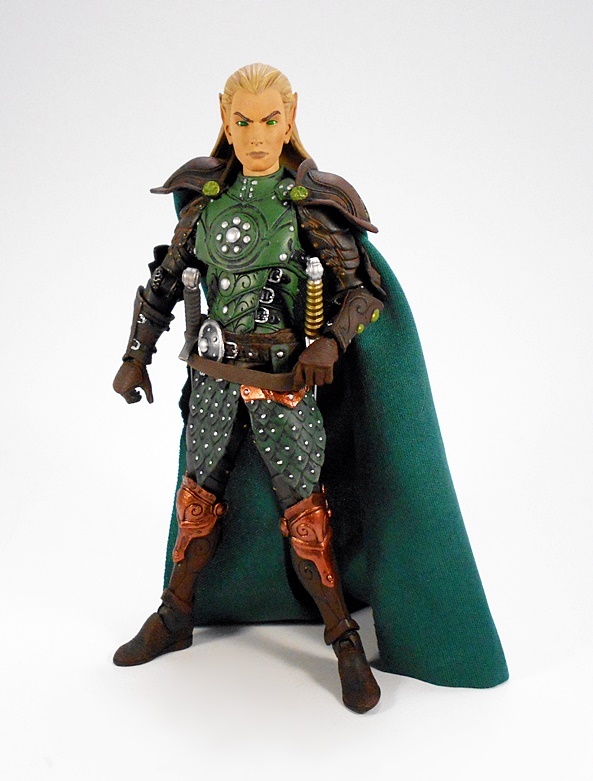 But thanks to some new paint, it takes what looked like plate armor and makes it look like a hard leather cuirass. 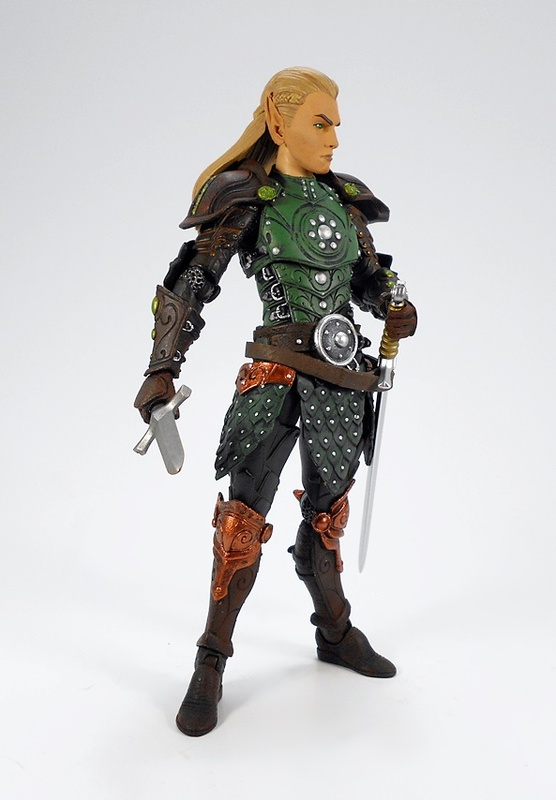 The fully armored arms and legs are replaced with a mix of segmented plates and chain mail on the upper arms, plate elbow guards, and what I presume are supposed to be leather bracers and boots, along with a set of copper colored knee guards. It’s a wonderful design, offering a combination of strong armored protection, toned down enough so that it looks like this Ranger would be able to track his way through the forests without getting slowed down by his outfit. The paint here is absolutely spectacular, both the choice of colors, as well as the applications. The green cuirass is given a wash to bring out the embossed scrollwork and give it a leathery look with silver painted studs, as well as individually painted securing straps meant to be holding it all in place. 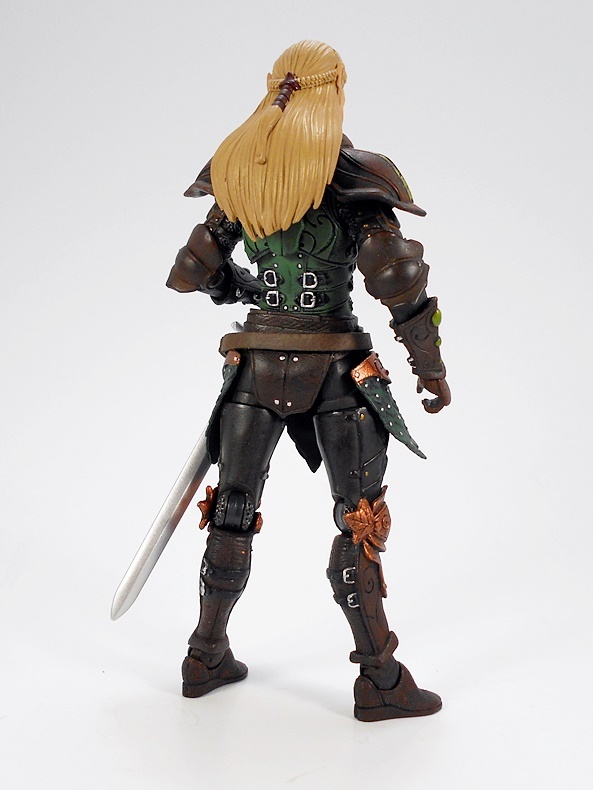 Indeed, the sculpted black straps with silver buckles can be seen securing his lower leg armor and even the back of his cuirass. It’s that kind of little attention to detail that I really appreciate. The segmented plates on the upper arms and the shoulder armor all have a wash that gives the armor a worn patina of rust. 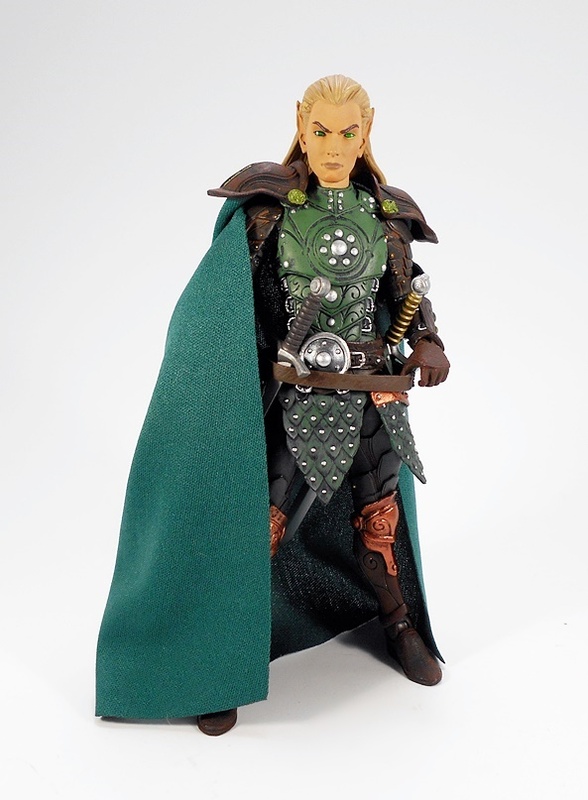 And while the flourishes of silver and copper are nice, the dominant mix of green and brown gives him an earthy look, and it probably would work pretty well as pseudo-camouflage in those densely wooded Elven forests. I never get tired of saying it, but these figures are absolute works of art. 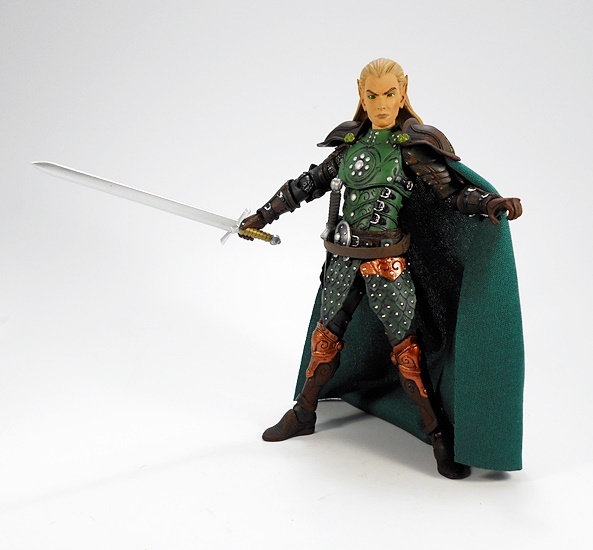 The Elf Ranger also comes with a green cloth cape, which compliments the color of the the armor quite nicely. 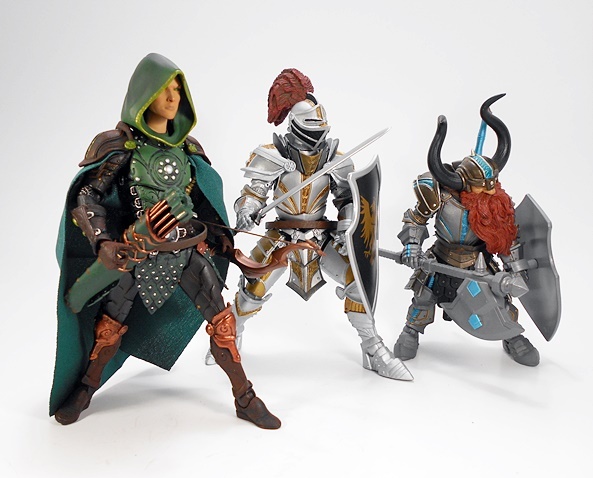 As always, these garments use the pegs on the shoulder armor to attach to the figure and you can even thread the holes on the cape through the actual shoulder pegs in the arms to make it more like a cloak. 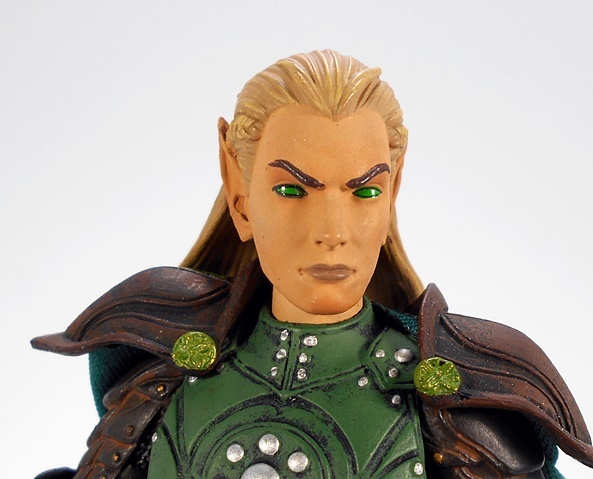 I really dig the head sculpt, which features the elongated elven ears bold lips, strong eyebrows, and a pair of pupil-less green eyes. 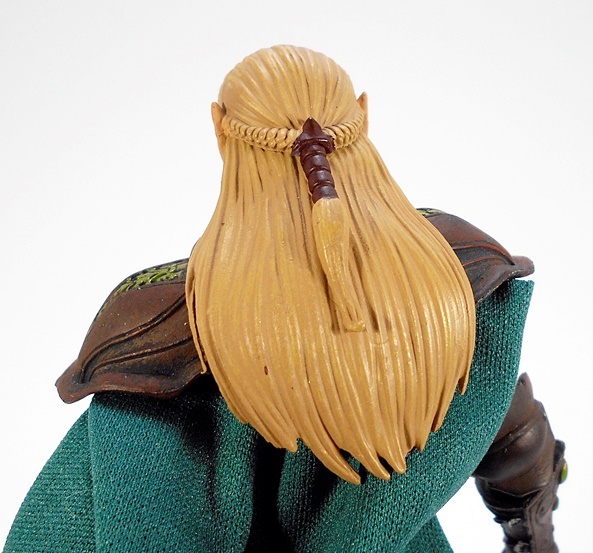 The long sandy colored hair is swept back to form a widow’s peak on his forehead and from behind it forms two braids, which meet together and are wrapped to become one. 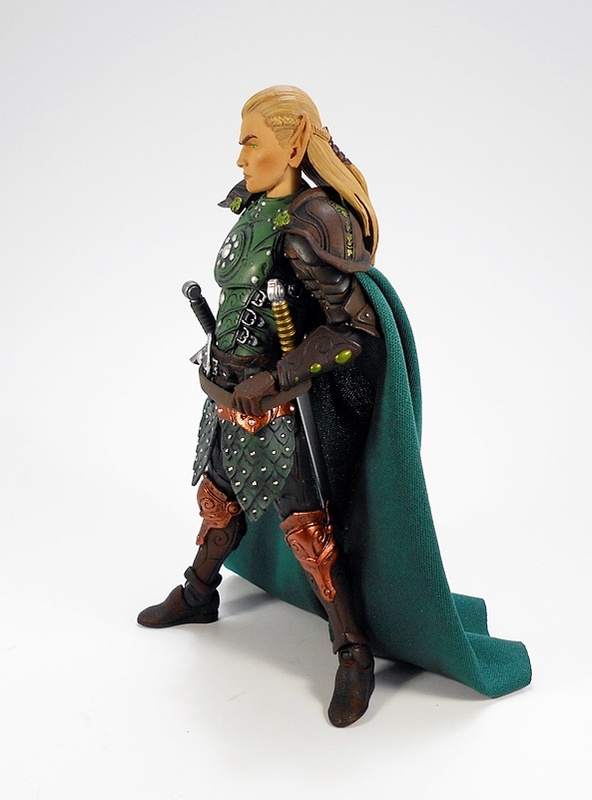 He comes with a separate hooded head, which is just different enough so that you could pass it off as a different portrait if you wanted a couple of these guys. At the same time, it looks close enough to be the same guy, assuming he’s concealing all that hair with some kind of elf magic. 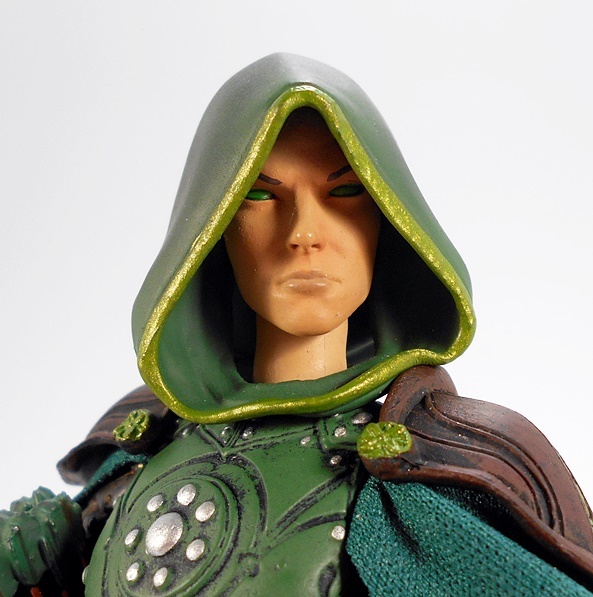 The hood is painted to match the green in the armor, and has gold trim around the edges. 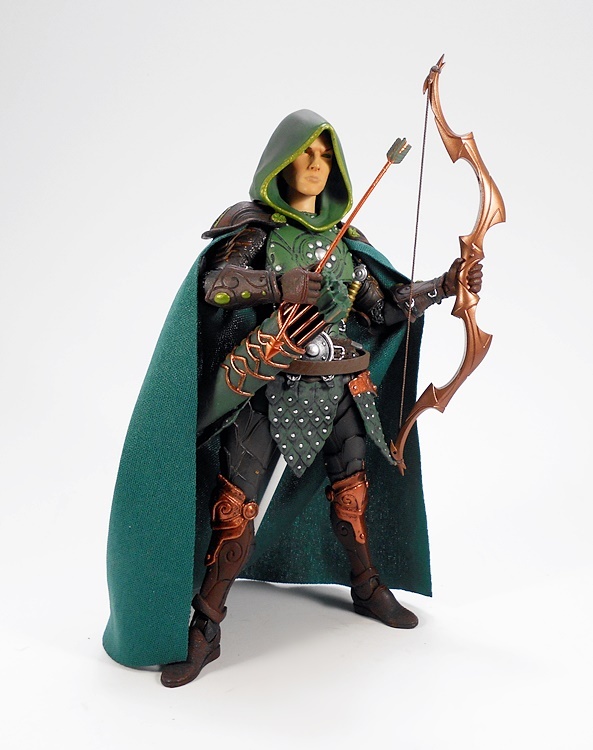 Here we also get the same bow and quiver that came with the Elf Legion Builder. Well, if you’re lucky it did. One of my Elf Legion Builders was missing his quiver. 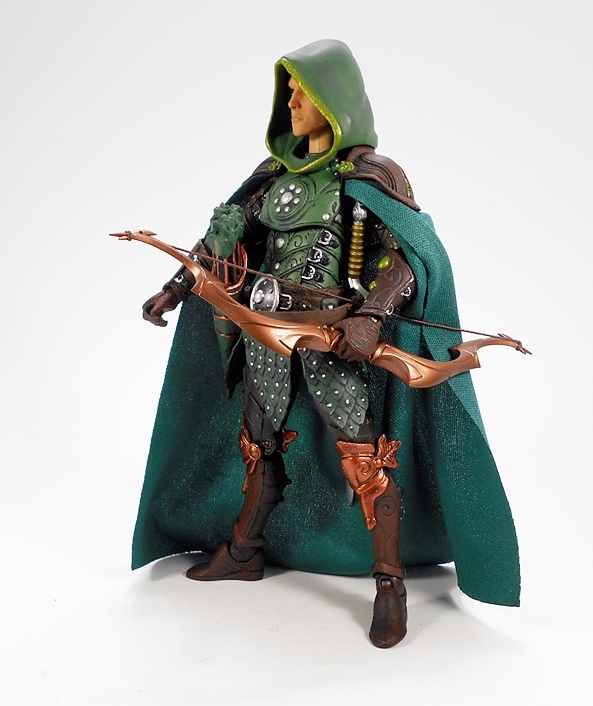 Anyway… this time the quiver is painted green with copper accents and the bow itself is painted copper with a brown string. 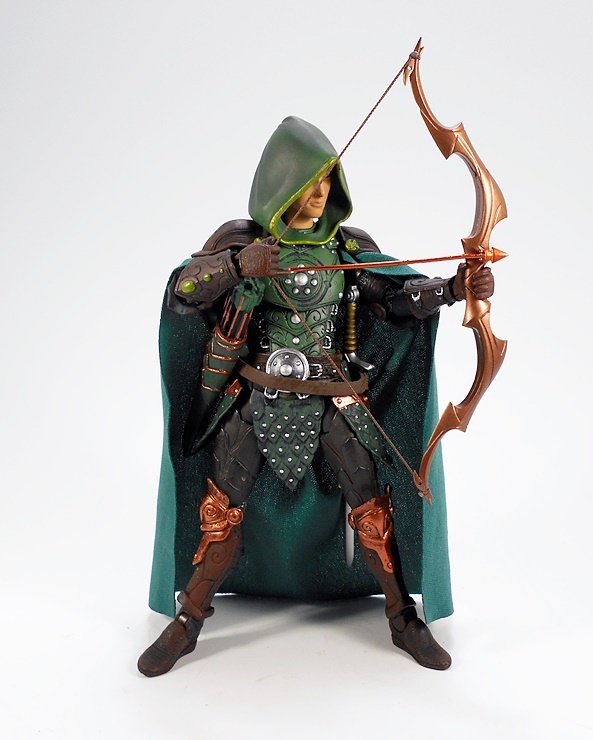 The arrows in the quiver are part of the sculpt, but you do get a single loose arrow that matches the green and copper coloring of those faux arrows. 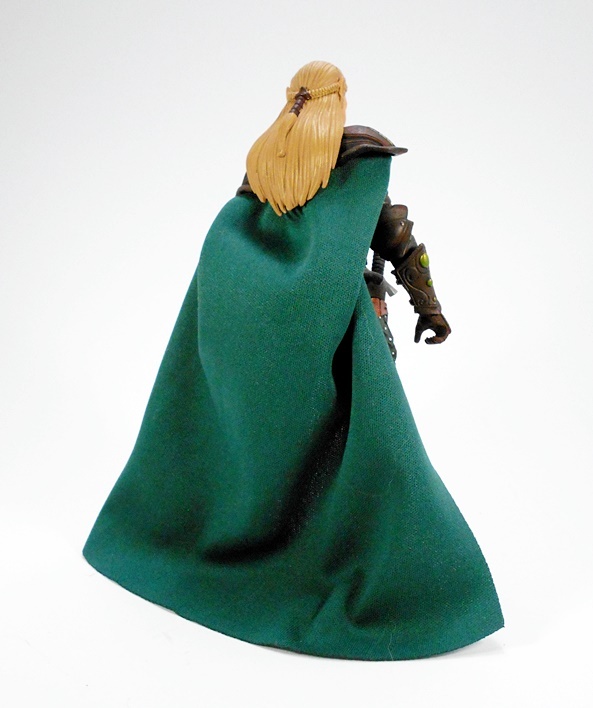 The quiver has a clip to attach it to the belt, and while I do tend to prefer having the quiver worn on the back with the fletchings peeking out over the right shoulder, that doesn’t work with the cape, and I can’t bring myself to display this guy without his cape. I mean, he may cast it off while fencing, but when he’s tracking his quarry through the forest, he’s got to have his cape, goddamnit! As before, there are two tiny pegs on either side of the bow that form a notch to help knock the arrow. 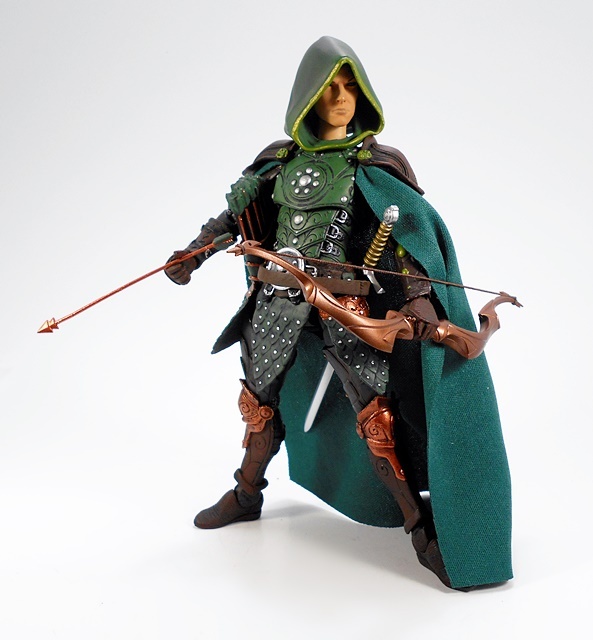 The range of articulation here isn’t exactly perfect for this sort of thing, but just like the Elf Legion Builder, I can get the Ranger to draw the bow and knock the arrow fairly well. 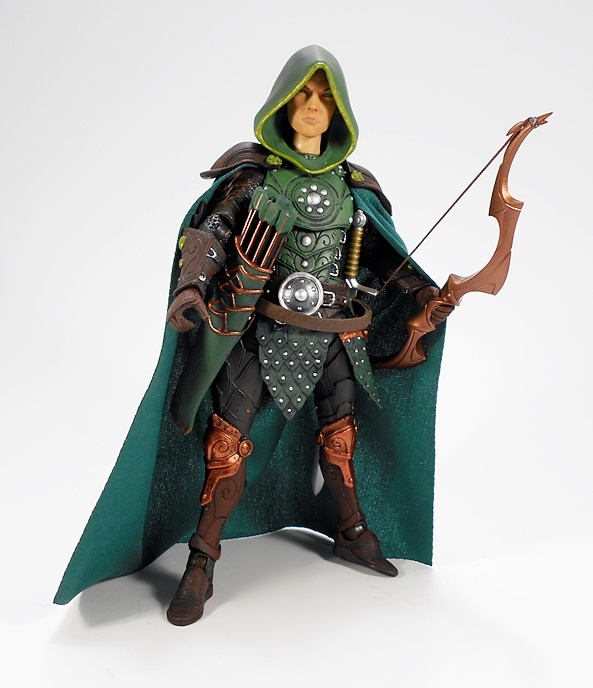 I will confess, however, a little piece of blue-tack inside the hand helps that arrow stay in place, because he can’t really hold it otherwise. Good god, I love this figure! The mix of parts makes for a great looking outfit and the coloring is just perfect. 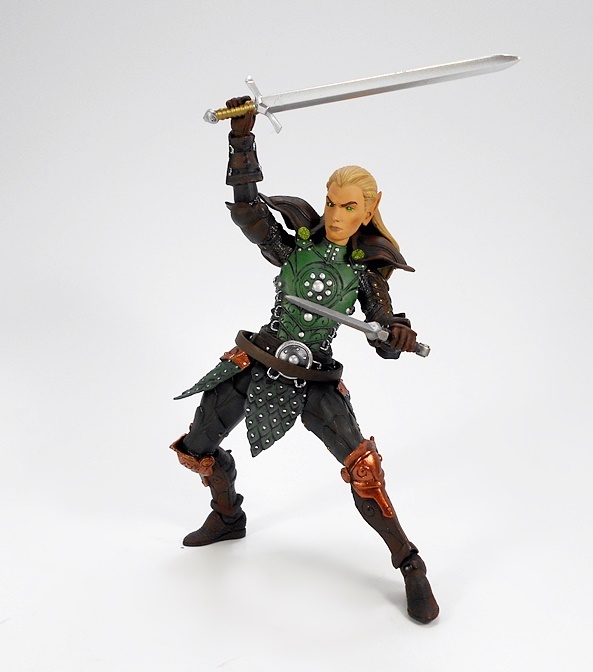 I’m pretty sure when I first got him out of the package, I just sat there looking at him with a big smile on my face. Then again, that’s almost a regular occurrence for me and this line. 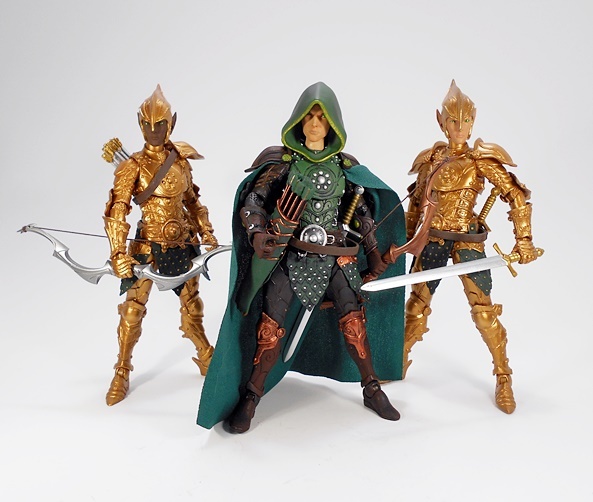 He’s not only a fantastic addition to the Elves of Mythic Legions, but he’s exactly the kind of character I would want taking part in one of my Saturday night AD&D expeditions. 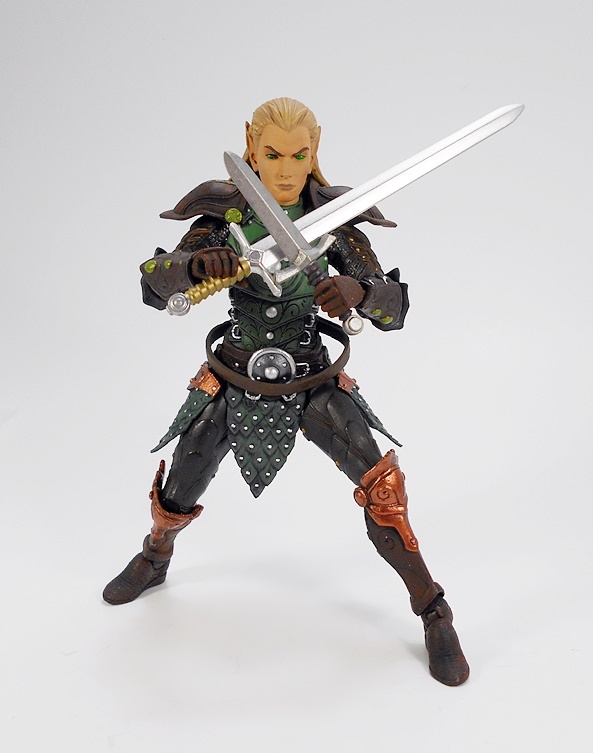 I want to sit down and think him up a name and a backstory, and pair him up with Sir Owain and Thord Ironjaw and have them go adventuring into some dark dungeon or maybe fight one of the Trolls.